Home Featured Article Colombia and the Philippines: Burying the hatchet? Not so long ago, there was bad blood between Colombia and the Philippines in the world of pageantry. The rift reached pitch high that it became necessary to publish an opinion piece urging both parties to forgive each other. Colombia and the Philippines are normally allies in the pageantry world as both experienced long dry spells. 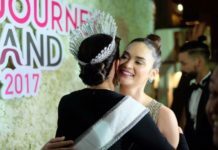 Both countries have passionate fans and before Miss Universe 2015, there was mutual respect and admiration. But when the relationship between the two countries hit rock bottom, there is no way to go but to bounce back. The recent events at Miss Universe suggests that fans from Colombia and the Philippines are burying the hatchet. Miss Universe 2016 2nd runner-up Andrea Tovar was warmly welcomed by Filipinos and despite some earlier missteps, she actually won over a lot of hearts. Andrea was not booed or disrespected at any point when she was in the Philippines. In fact, a lot of Filipinos think she will win. Even Miss Philippines Maxine Medina developed a cordial relationship with Andrea. Both candidates never felt there was rivalry between them and the events of 2015 were simply treated simply as a history and nothing else. Sure, there might be some residual bad taste left among fans but these are a far cry from the post-Miss Universe 2015 situation. There is that current lull of bashings and insults but the trend suggests that this might last. The Philippines may be contemplating on what will be its future at Miss Universe but Colombia is gaining ground in its quest for its third Miss Universe title. Both countries were allies because they were relatively weaker at Miss Universe especially during early 2000s. But as the quest for another title intensifies, so will the rivalry. The Philippines had already overtook Colombia at the Big5 Ranking. CLICK HERE As both countries strive to win another title, the Colombian-Philippine alliance may find itself in a precarious situation.